Oxford UP – UK. Oxford UP – US. Amazon – UK. Amazon – US. 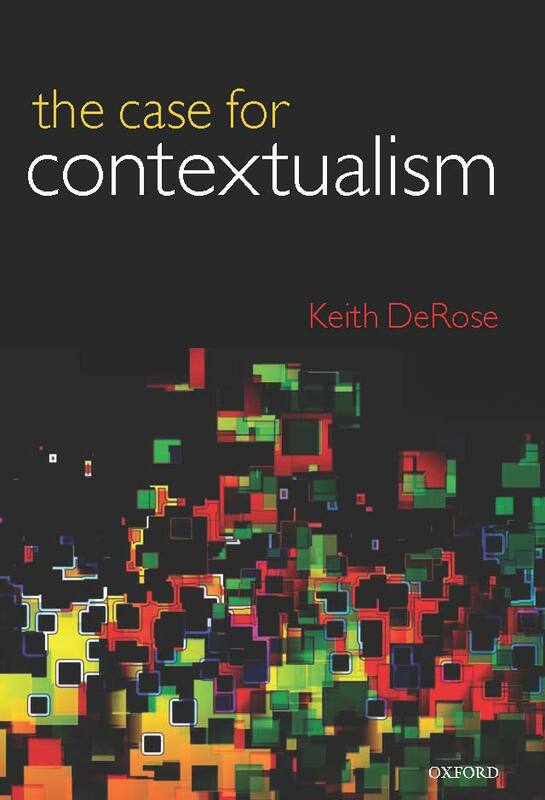 This book gathers several of my ealier defenses of contextualism in epistemology, reworking previously published papers, together with lots of new material. Detailed table of contents: pdf link. Contextualism is the view that the epistemic standards that a subject must meet in order for a sentence attributing knowledge to her to be true vary according to the contexts in which those sentences are uttered. This volume argues that contextualism is true and is superior to its rival, invariantism, in both of the latter’s main forms: classical invariantism and subject-sensitive invariantism. Chapter 2 presents the main argument for contextualism: the argument from the ordinary usage of “know(s).” Chapter 3 utilizes the knowledge account of assertion both to answer the most important objection to Chapter 2’s argument and to underwrite a second positive argument for contextualism: the argument from variable conditions of warranted assertability for simple assertions. Chapter 4 explores options for how to handle the semantics of context-sensitive terms in situations of disagreement among speakers, and answers objections to contextualism based on its alleged inability to handle such disagreements. Chapter 5 answers several objections to contextualism that allege that in various ways “know(s)” does not behave like a context-sensitive term. Chapter 6 argues that contextualism has an important advantage over subject-sensitive invariantism in virtue of its ability to respect “intellectualism,” the thesis that questions over whether a subject knows something turn exclusively on truth-related features of the subject’s situation. Chapter 7 explores important connections between knowledge and various evaluations of actions. Against recent claims that important advantages for subject-sensitive invariantism are to be found here, it is argued that contextualism actually handles these connections better than does subject-sensitive invariantism. In this initial exposition of contextualism, the view is explained and distinguished from other views, and especially from its rival, invariantism, whose two main forms, classical invariantism and subject-sensitive invariantism, are explained. The various views are discussed largely by reference to how they handle examples that display an important feature of the ordinary usage of “know(s)”: that what speakers are happy to call “knowledge” in some contexts they won’t count as such in others. After various preliminary issues are addressed and a brief history of contextualism is provided, the relation between contextualist solutions to philosophical skepticism and contextualism’s roots in what transpires in ordinary, non-philosophical conversation are discussed. This chapter presents the main argument for contextualism: the argument from the ordinary, non-philosophical usage of “knows.” Both the features of ordinary usage that support contextualism and the reasons why these features provide such strong support are scrutinized. Hence, there is considerable focus on the methodology of ordinary language philosophy, and especially on the question of just when it is important for a theory of the meaning of a term to make ordinary claims involving that term come out true. The chapter’s Appendix looks briefly at contextualist accounts of terms other than “knows that,” and discusses whether similarly powerful grounds exist for these other contextualisms. This chapter battles the most common objection to the contextualist’s argument from ordinary usage: that what the contextualist takes to be a variation in the truth-conditions of knowledge-ascribing sentences is really just a change in the conditions under which those sentences are proper to assert. By investigating the conditions under which such “warranted assertability maneuvers” should be heeded, it is argued that this objection is highly unsuccessful. The knowledge account of assertion is presented, defended, and used both to undermine an advanced form of the warranted assertability objection, the generality objection, and to provide a second positive argument for contextualism: an argument from the variation in warranted assertability conditions of simple (non-knowledge-ascribing) claims. The chapter’s Appendix combats particular attempts, by Peter Unger and Patrick Rysiew, to provide invariantist accounts of the linguistic phenomena that contextualists appeal to. In disputes involving context-sensitive terms, speakers can seem to be contradicting one another, even as they also appear to be pushing the “conversational score” in different directions. Several options for how to deal with such situations are presented, culminating in the “gap view,” a supervaluational approach. The “asymmetrical gap” view is presented as a way to handle the relation between claims made at different times in a single conversation and also to handle cases of “one-way disputes”: cases where a speaker in one context disputes a claim made by another speaker in a different context. By showing the issues addressed to be general issues that arise even with terms that are uncontroversially context-sensitive, and by showing ways to resolve such issues, this chapter rebuts objections to contextualism based on its alleged inability to respect our sense that disputants in arguments over what is “known” are contradicting one another. This chapter addresses several objections to contextualism, some of which have been prominent: objections from judgments of comparative content, and objections based on how “know(s)” behaves within metalinguistic claims, belief reports, speech reports, and in connection with devices like “I never said that.” By comparing “know(s)” with the behavior of clearly context-sensitive terms, and especially by focusing on the right sorts of cases – cases in which the contextualist really will hold that the content of “know(s)” changes – it is shown that these objections all fail. Against the claim that the contextualist must make a lame and costly appeal to “semantic blindness” to escape certain problems, it is shown that the way in which contextualism actually implicates speakers in such blindness does not hurt the view, because speakers are implicated in equally problematic semantic blindness whether or not contextualism is accepted. Contextualism is shown to avoid certain problems, and to thereby gain an important advantage over subject-sensitive invariantism, by its ability to respect “intellectualism,” the thesis that questions concerning whether subjects’ true beliefs amount to knowledge turn exclusively on features of those subjects’ situations that are truth-relevant, in that they affect how likely it is that the belief is true, and by its related ability to avoid sanctioning very implausible-sounding “Now you know it; now you don’t” claims. The “fallacy of semantic descent,” by which it is held against a theory that it has a certain implausible implication, when the theory’s actual implications are instead higher-level claims, is exposed, to disarm resistance to contextualism based on such confusions. Subject-sensitive invariantism is shown to be wrong by its inability to handle certain important third-person uses of “know(s).” Attention is then turned to important uses of “know(s)” made in connection with certain evaluations, explanations, and predictions of agents’ actions. Some writers have thought that an important advantage of subject-sensitive invariantism over contextualism is to be found in the former’s superior ability to account for the connections here. Particular objections to contextualism based on such considerations are answered. 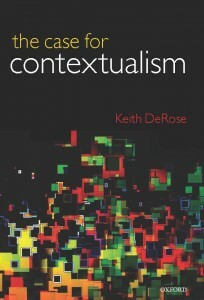 Finally, it is argued that contextualism actually does a better job with the relevant uses of “know(s)” than does subject-sensitive invariantism, because only contextualism can handle cases where whether a subject does or does not “know” is cited in connection with potential actions the subject may, or may not, take.